Rabbi Shar Yishuv Hacohen wrote of the fall of Jerusalem and of his own inner debate between Torah study and armed combat. Sixty-five years after the fall of Jerusalem in the War of Independence, the publication of a diary written by now-renowned Rabbi Shar Yishuv Hacohen sheds new light on life in the city in the midst of battle. Rabbi Hacohen gave his diary to the Neve Shaanan College, which is putting together a biography on him. His diary reveals the joy that prevailed in the Old City of Jerusalem when David Ben-Gurion declared a state, the bitter disappointment when Israeli soldiers failed to come to Jerusalem’s aid, and Rabbi Hacohen’s own internal debate over the question of Torah study versus military service. “A storm of emotions burst out within me, and I was choked by tears. A battle began within me between my primary obligation to save lives in the city of Jerusalem, the city I love, and Torah,” he continued. In a later entry, Rabbi Hacohen described Israel’s declaration of independence as heard in the embattled Old City. “There was complete quiet. All that could be heard were the bullets and mortars fired by the Arabs, mixed with Ben-Gurion’s thundering voice… When he got to the words, ‘by virtue of our natural and historic right and on the strength of the resolution of the United Nations General Assembly, [we] hereby declare the establishment of a Jewish state in Eretz-Israel, to be known as the State of Israel,’ we burst into joyous tears. The Jewish residents of the Old City were overjoyed when a unit of Israeli fighters from the Palmach entered the old city. But the joy soon turned to disappointment. “We suffered great disappointment and terrible despair when it became clear that the Palmach was leaving at dawn. They said that after four days of heavy fighting, they had no strength left for battle. 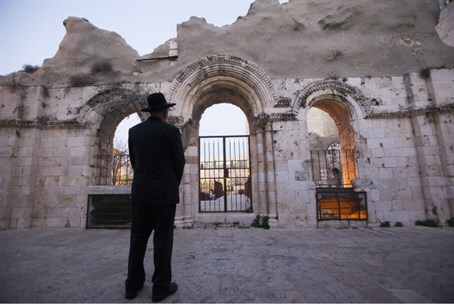 They had to return to their base,” the young Rabbi Hacohen wrote. “We asked the Jerusalem command to send other companies to replace the Palmach… We asked, in tears, that they hold the posts around the Zion Gate until we could get the wounded and the civilians out. We were not answered. The few Jewish fighters were ultimately overpowered, and the Old City fell to Jordan. It was reclaimed 19 years later during the Six Day War.